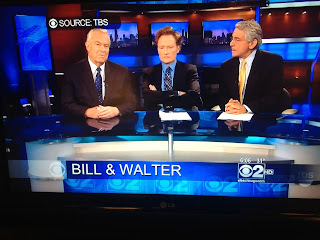 I am in Chicago to make a presentation tomorrow morning to the National Association of Mutual Insurance Companies tomorrow and I got to see Kansan Bill Kurtis made his final newscast as anchor on WBBM -TV. 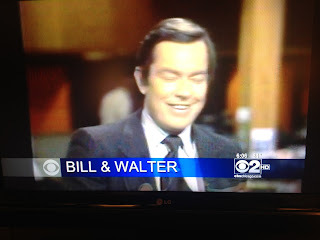 Bill Kurtis' tribute newscast this evening. Bill was brought to national attention on June 8, 1966, when he told his WIBW TV viewers, For God's sake, take cover! as the Topeka tornado approached. 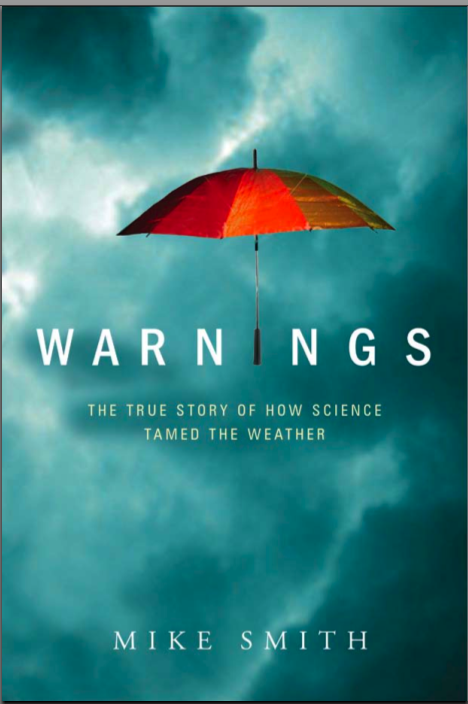 That is a story I tell in my book, Warnings. The watches and warnings during the Topeka storm -- combined with television coverage -- was one of the earliest major successes of the fledgling tornado warning system. 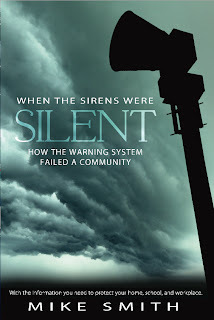 Got asked why the price for When the Sirens Were Silent is so low (I would say, "reasonable") at $2.99? A person pointed out to me that there are many "schlock" books at that price point. I don't know about that. Because the Joplin tornado was so horrendous and so much went wrong that day, I wrote the book to help insure it never occurs again. With tornado season looming (wouldn't be surprised to see some in the March 8 to 12 time period), please take a look at this very reasonably priced guide. Even though the softcover books are gone, we will not raise the price of the ebook. While the ebook will hopefully last forever, the final softcover copy is available at Amazon. 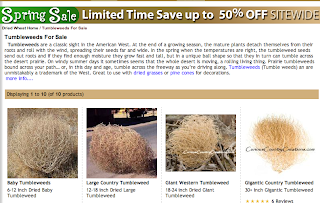 If you wish to purchase, click here. The Kindle version ($2.99) is here. The Nook version is here. Things look pretty quiet for the nest week as Mother Nature catches her breath. However, a new storm will affect the West Coast about March 6-9 and will move into the Central U.S. March 8 to 11. Here is what the ten day chart shows. 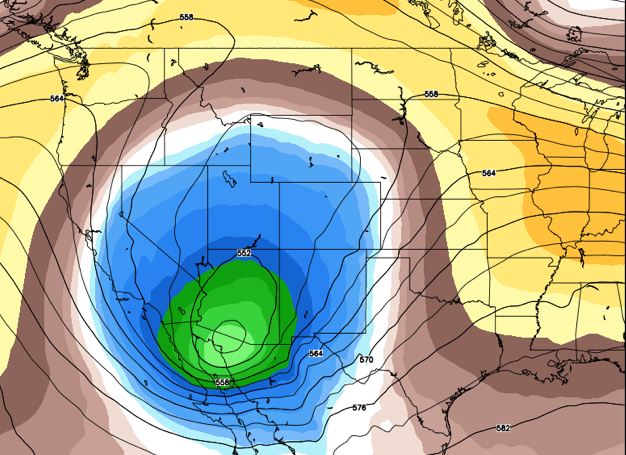 The low is on the Mexico-Arizona border at that time. Details here. See you Saturday! 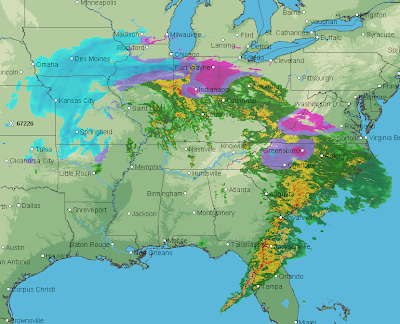 No major storm today but snow is falling in many states. And, here are the winter weather warnings. 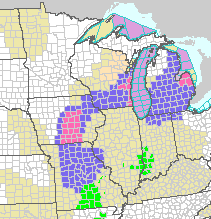 Pink is a winter weather warning. Blue is a winter weather advisory (lesser condition) and green is a flood warning. 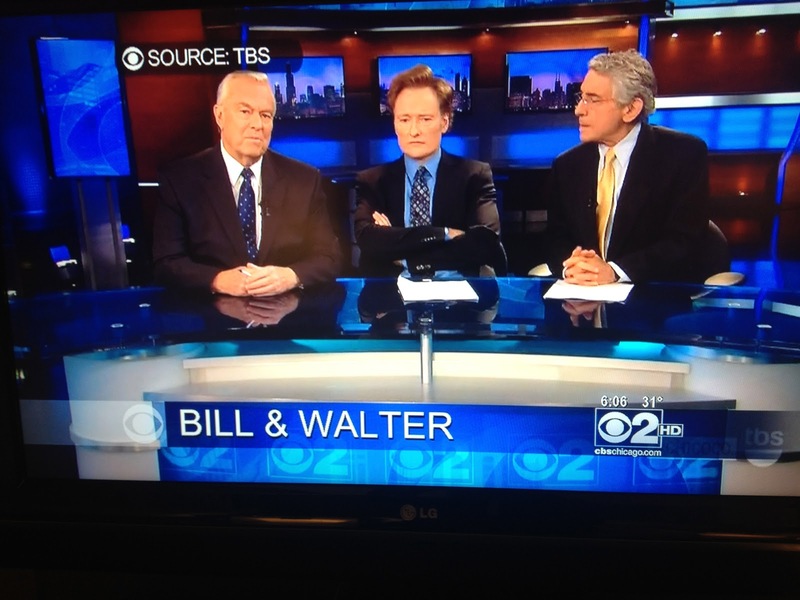 We meteorologists get that question all the time. Excellent guide is here. 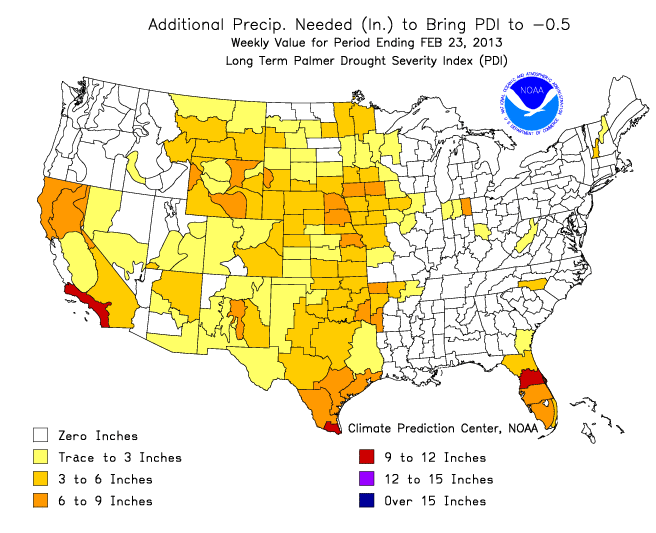 Why do I focus on the winter wheat belt this time of year? Because that crop was planted in September and October, 2012, and is in the ground -- but dormant -- at this time. Unlike, say, corn and soybeans which are harvested in fall, winter wheat is harvested in May in Texas moving north to southern Nebraska in July. Last year's crop was greatly reduced by the drought and this year's did not get off to a good start for the same reason. Things are looking up a bit. 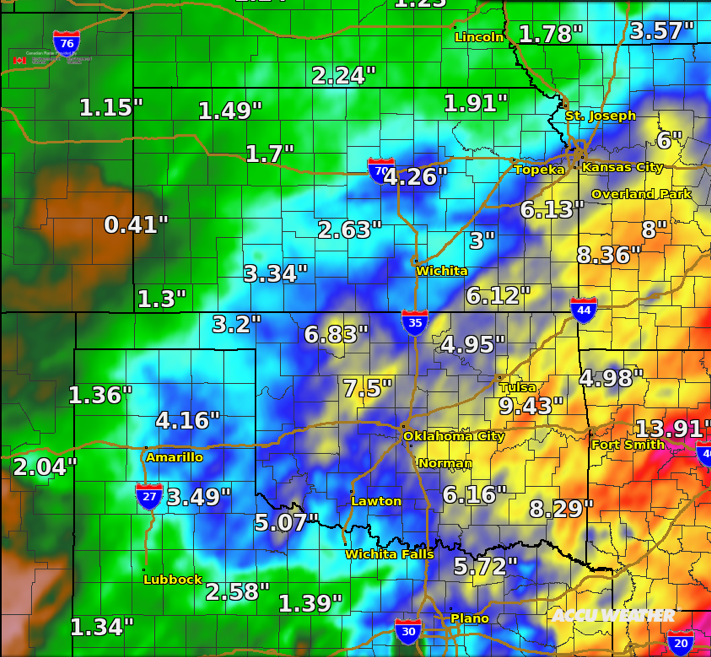 Here is the moisture over the winter wheat belt from the just-ended storm. 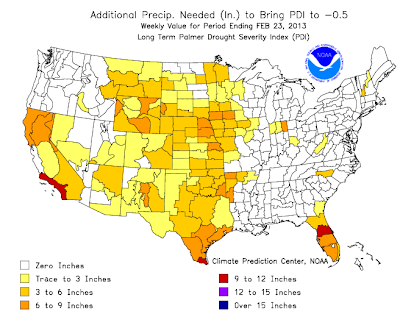 The map below, as of Saturday, was the moisture (in additional to normal) needed to break the drought. So, add in the amounts above and you can get an idea where you stand right up to today. 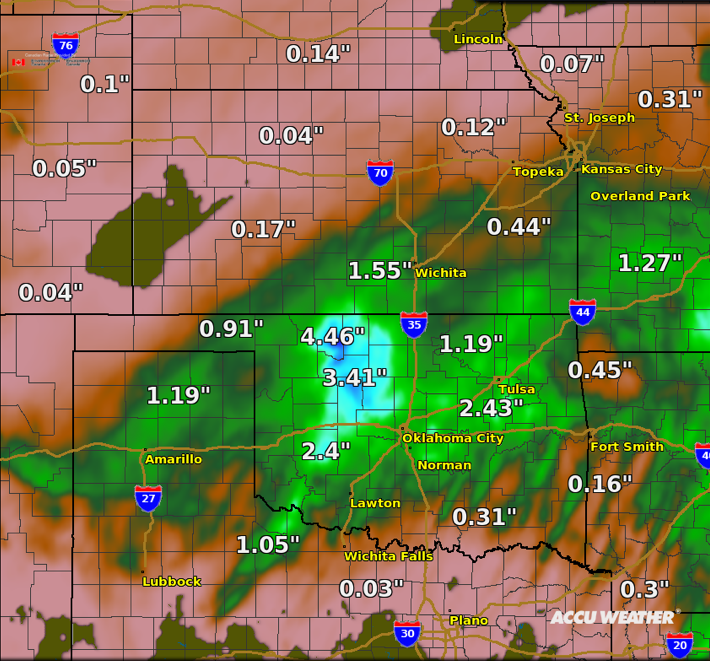 And, here is the total moisture since January 1. The Blizzard of Oz II continues to wreak havoc. There have been "several" roof collapses this morning in the Kansas City area alone. 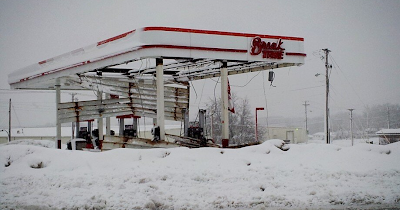 I grew up near the suburb of Belton, MO where this occurred. 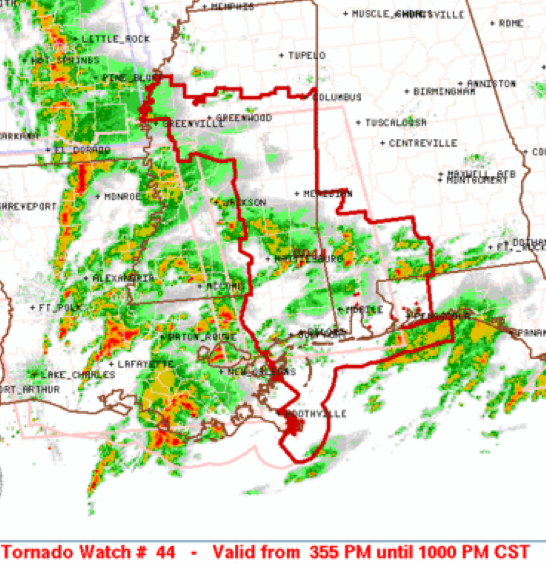 See below for the parts of the tornado watch (issued well in advance) that are still in effect. ADDITION 8:20pm. Too bad I didn't know about the damage earlier. 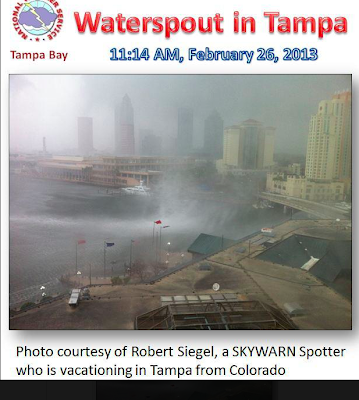 "Tornado Hits Hooters!" would have been a far better headline. Damage did occur, details here. It looks like Christmas morning at Ralphie's house in the Wichita area this morning. But looks are deceiving. Southbound Interstate 135 north of Wichita is closed due to accidents blocking the road. Westar Energy reports 8,600 homes and businesses without electric service. The official snowfall at the NWS in Wichita was 6.5 inches, lower than my earlier forecasts (7 to 14 inches) for this storm (revised downward Sunday night). 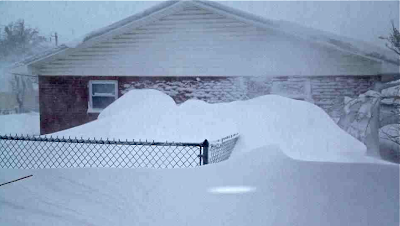 Two foot drifts are present in the western part of the Wichita metro area and the rural Butler Co., there are drifts to three feet. The highest report I have seen in the immediate area is eight inches. February, 2012 2013, is the snowiest month in the history of Wichita where official records go back to 1888. We've had 21 inches. Our average snowfall for an entire winter is sixteen inches. Finally, our friends at Klingenberg Farm produced another wonderful video about the Blizzard of Oz II and what it was like out on the Kansas range. You'll enjoy watching. Update 8:45am: The FAA just limited traffic for O'Hare. Average delays are expected to be two hours and 24 minutes. 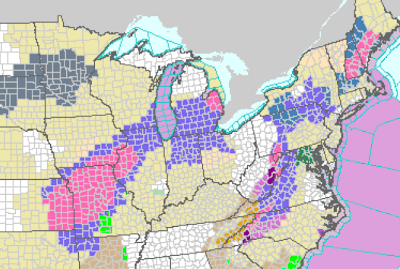 Deep purple is an ice storm warning. There will be strong winds (amber is a high wind warning) which means possible power failures. Pink is a winter storm warning. 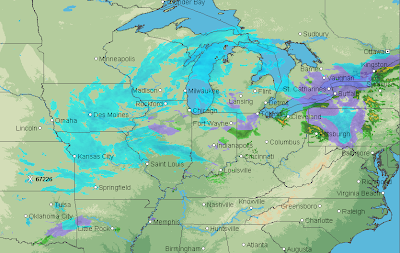 Yes, Chicago will receive snow, 5 to 9 inches and it will be starting this morning. 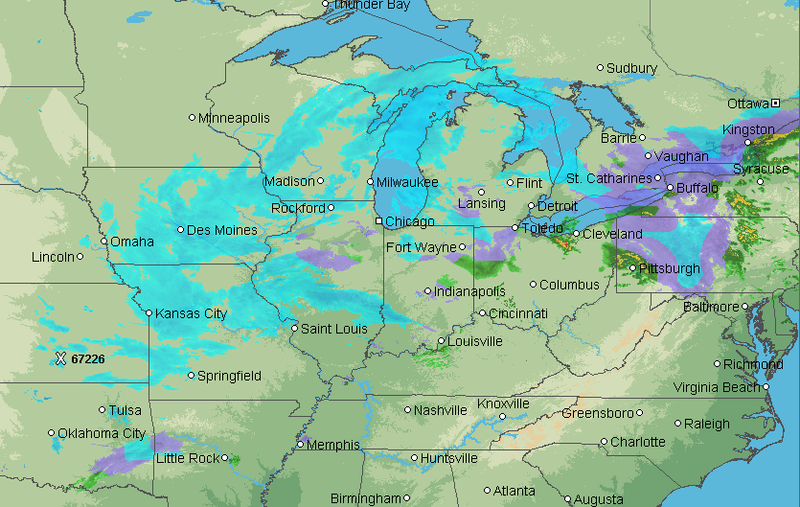 Here is the AccuWeather Regional Radar. I expect significant delays at O'Hare and Midway. 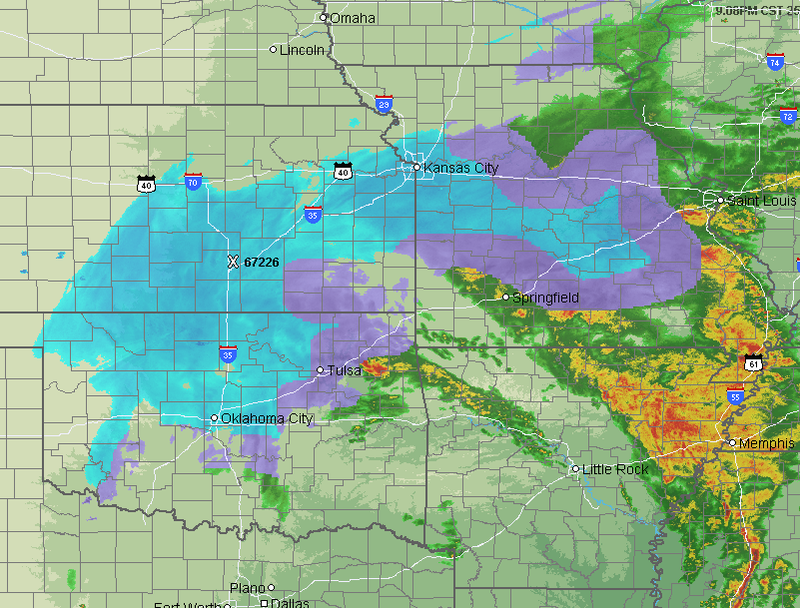 The Amarillo and downtown Kansas City Airports are completely closed (not KCI which is the main passenger airport). 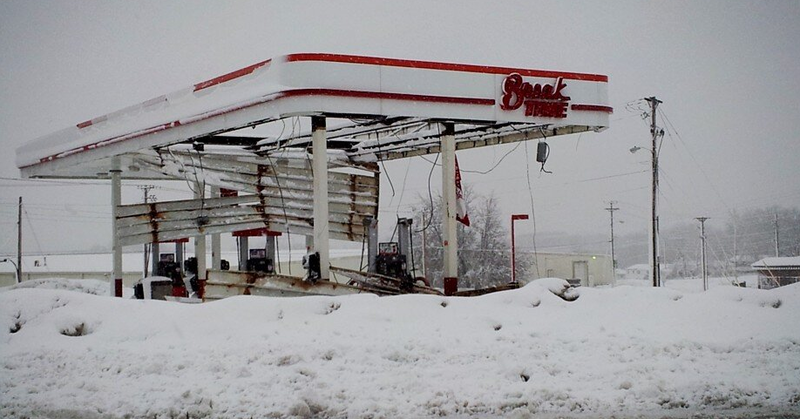 Latest roof collapse is from Columbia, MO. This storm has left a long trail of collapses all the way to the Texas Panhandle. 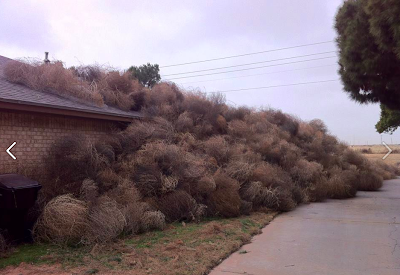 This photo was taken near El Paso where there were 84 mph winds yesterday. 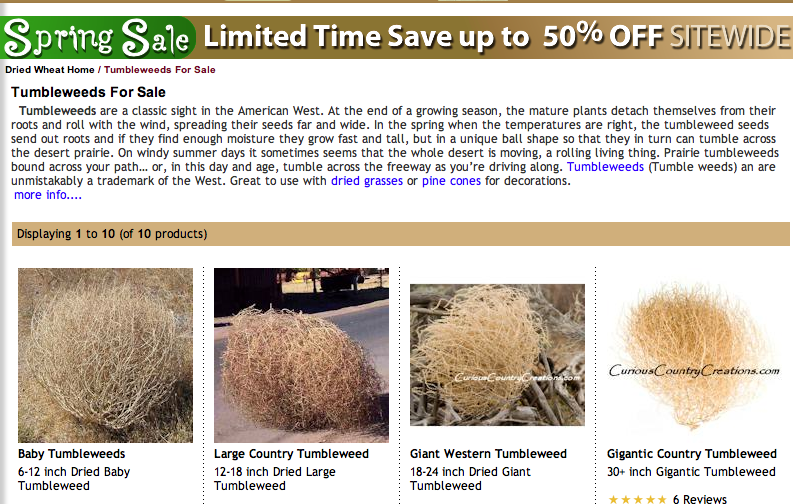 Did you know there are companies that buy and sell tumbleweeds? I'd say these folks have newfound riches. Outside the Smith House at 9:05pm. Wind gusting to 30 mph. 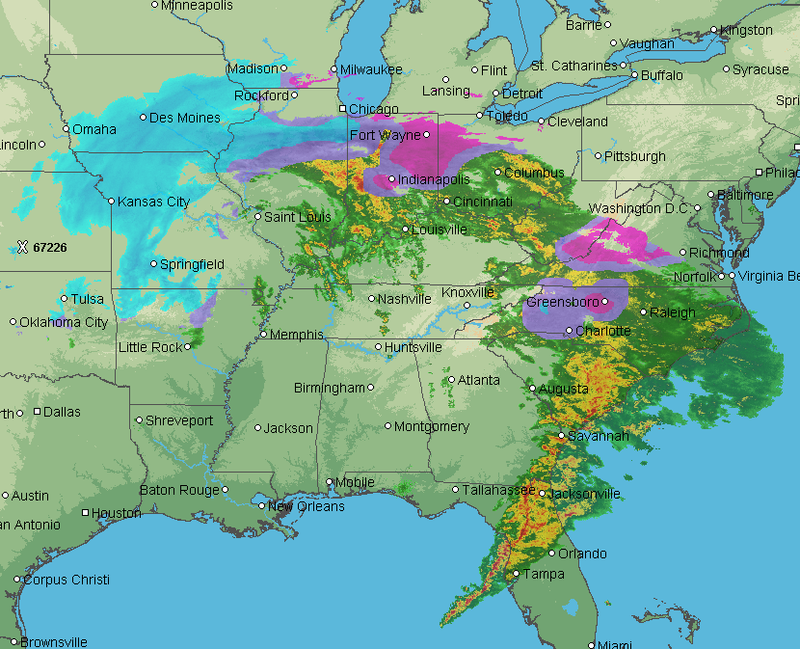 Here is the AccuWeather Regional Radar at 9:05pm CST. The photo above was taken at roughly the X on the map. There is some lightning to the southeast. 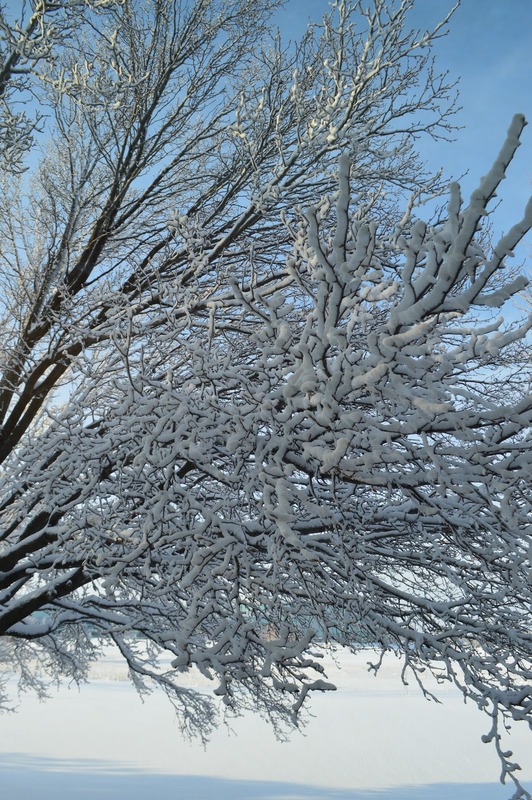 Tuesday will be another snow day for Wichita Public Schools due to the overnight snows. The snow has ended in the Texas Panhandle but travel is still crippled. It will be tomorrow, at least before it gets back to normal. Photo below via Twitter. Their sky cleared just before sunset. I count at least 12 stuck cars, including a Hum-Vee. 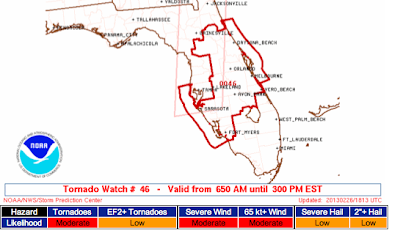 No reason to change the earlier forecasts. 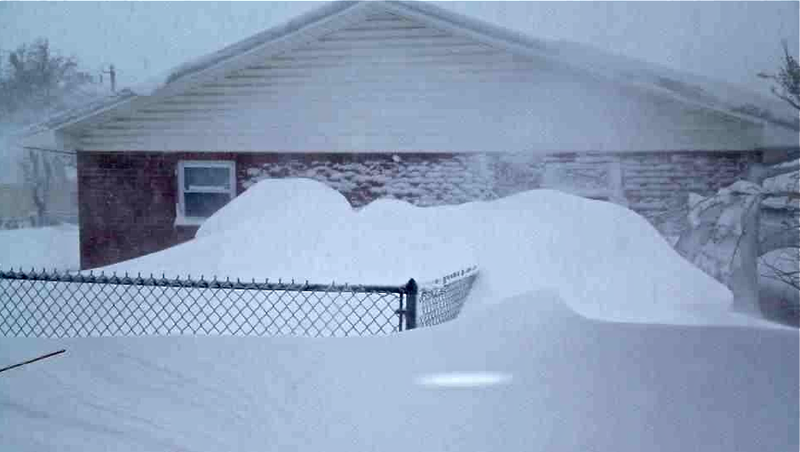 Seven foot drifts at Vici, Oklahoma. Photo via Twitter. Amarillo, 19" with gusts to 77 mph and drifts to 5 ft.
Borger and Fritch, 16 inches. Pampa and Perryton, 15 inches. Numerous stranded motorists and even stranded emergency vehicles in these areas. Addition at 8:45pm: Numerous reports of power failures in south central Kansas. 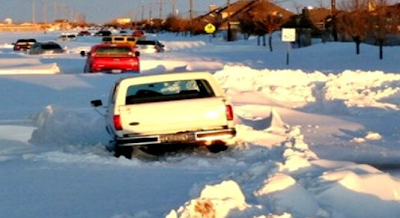 At last report, all roads in Texas Panhandle remain closed. Here is a list of roads closed in Kansas including some going into Oklahoma. 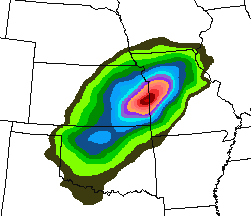 The greenish area in east central Kansas (near Ft. Scott) is a prediction of 15 to 20 inches. The transition from blue to rose I'm defining as eight inches. Winds over southern Kansas and northern Oklahoma are frequently gusting from 35 to 40 mph. 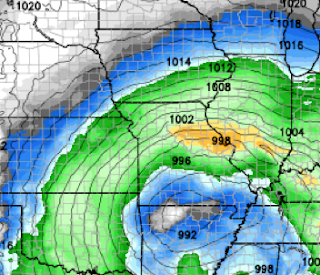 I expect winds to increase this evening in east central Kansas and western Missouri and then into northeast Missouri during the day Tuesday. Blizzard warning in orange. 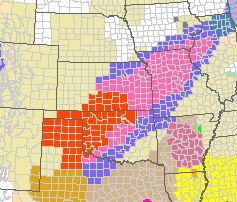 Pink is a winter storm warning (note, a severe thunderstorm watch is out in Arkansas with a similar color) and amber is a high wind warning. 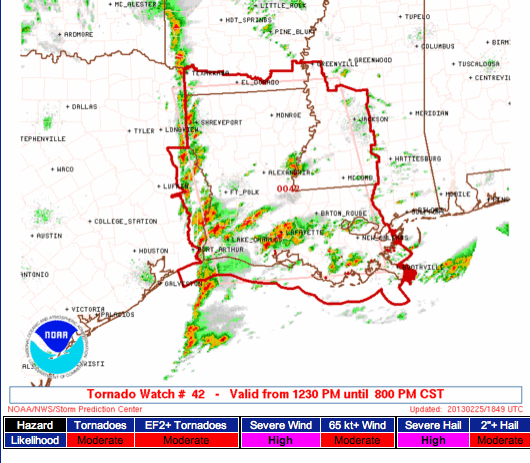 I am not live-blogging the tornadoes. 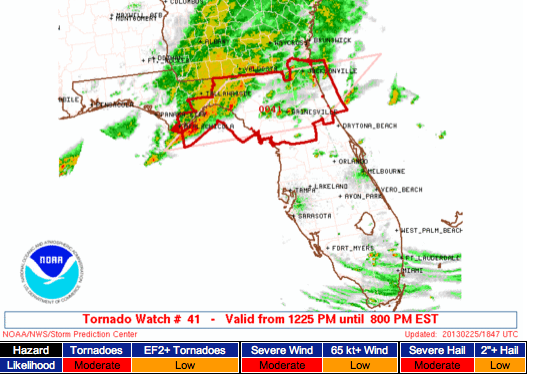 Keep an eye on the weather in these areas! My nice clear driveway is rapidly covering over. Heavy snow falling at the Smith House with gusts to 30-35 mph and quarter-mile visibility. It is all downhill from here. The whooshing sound is the wind through the trees. Temperature at Jabara Airport was 30°F (one mile away). The NWS in Amarillo reported a 75 mph wind gust. The mayor of Kansas City has declared a state of emergency until Wednesday morning. If the snow has started in your location, it is time to hunker down. 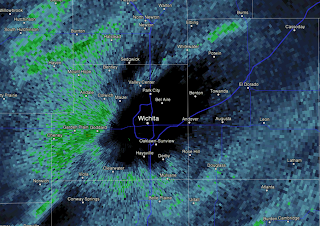 The immediate Wichita NWS radar looks like this at 12:20pm. 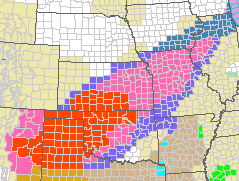 Current blizzard warnings in orange and winter storm warnings in pink. Please take this seriously! 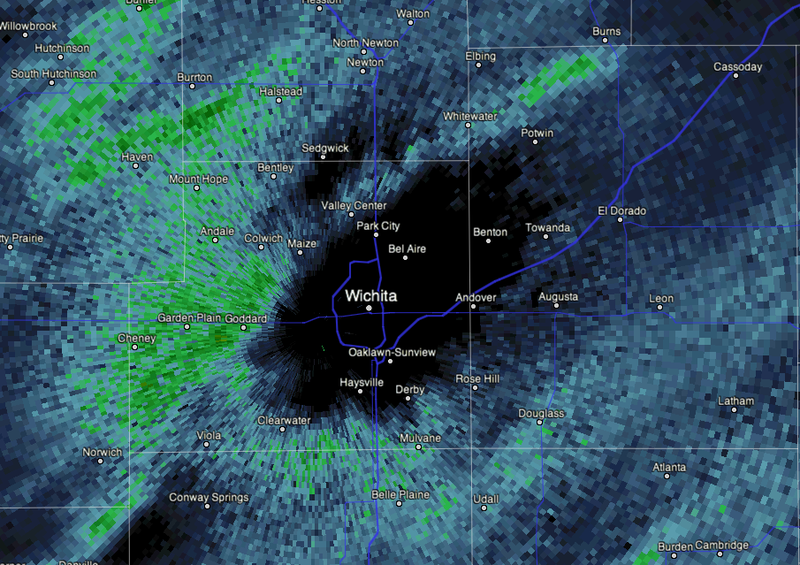 The radar is over-estimating in the city of Wichita, just a few flurries at the moment. 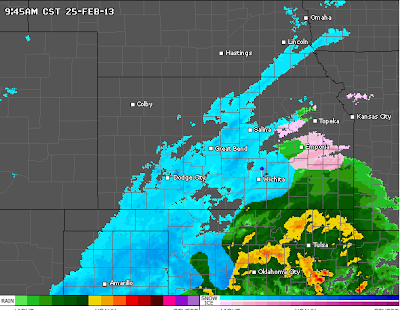 However, snow will be moving over most of the area by noon. These amounts do not overlap. If snow is indicated at your location on more than one map, you must add the amounts to get a "storm total." To help you time the storm at your location: Here is the predicted snow from 6am this morning to 6pm this evening. 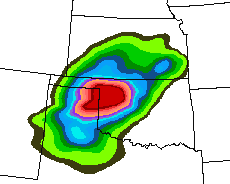 Yes, that is more than 15 inches in northwest Oklahoma! Fierce blizzard conditions will make travel very dangerous with possible life-threatening consequences. Again, that is 15" in 12 hours near Ft. Scott, Kansas. If this is correct, very heavy snow in the far south reaches of KC Metro (Lees Summit, Pleasant Hill, Belton, Stillwell but more moderate amounts toward KCI. 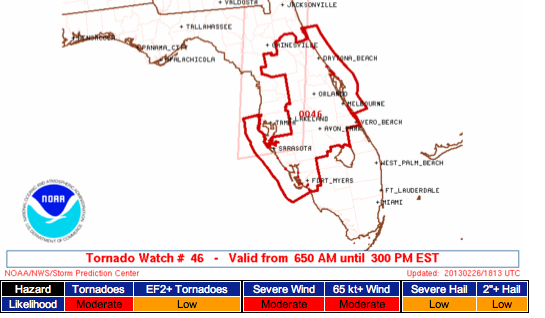 Finally, from 6am Tuesday to 6pm Tuesday (see scale above). Yes, Chicago could get a nuisance snow storm. At 6pm CST winds will be gusting to 50 to 55 mph in the amber area near the Kansas-Oklahoma border. Winds will be rapidly increasing in western Missouri. 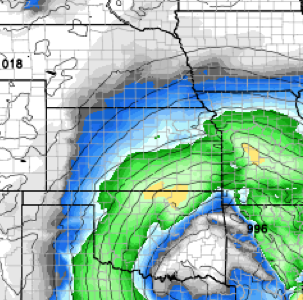 By midnight tonight, winds will be gusting to 40 to, perhaps, 45 mph near the Kansas-Missouri border (colors do not correspond because these are winds above sea level). 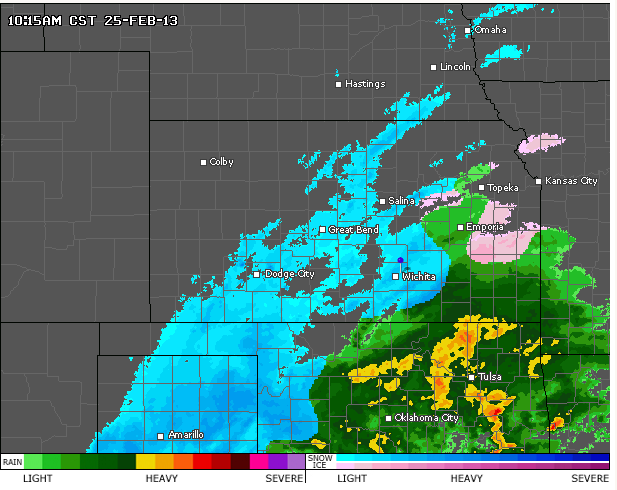 Tuesday morning, winds will be gusting to 40 mph with very heavy snow in northeast Missouri. St. Louis is going to have brisk winds but only light snow. No updates till late afternoon or early evening. Additional details from AccuWeather. 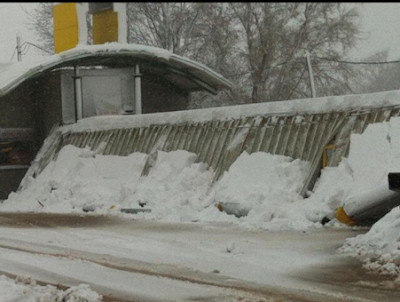 Amarillo, TX has 13", still snowing, drifts 3 to 4 feet. All roads Texas Panhandle are closed. Elk City (western Oklahoma on I-40) has eight inches and still snowing hard. 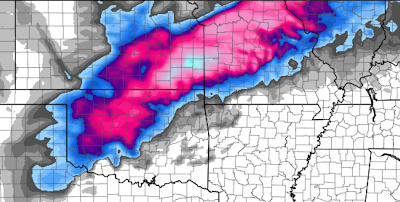 I-40 will likely be closed in western Oklahoma if it hasn't been already. Still don't have an update from Woodward in northwest Oklahoma but they had eight inches at 8am and snowing hard. From Amarillo earlier this morning. 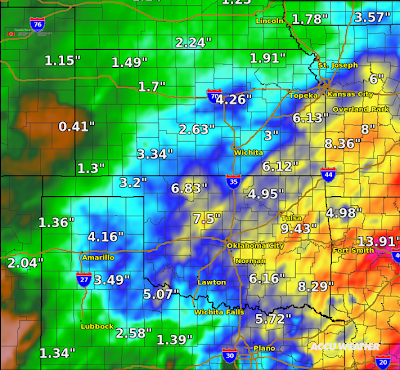 Video by Amarillo NWS. This fierce blizzard is spreading east! UPDATE 9:54AM: All roads in the Texas Panhandle are now closed. Texas DOT is withdrawing all of its units. Stuck motorists are on their own. Update 10:15am: Woodward, OK reports 8" and still snowing hard. 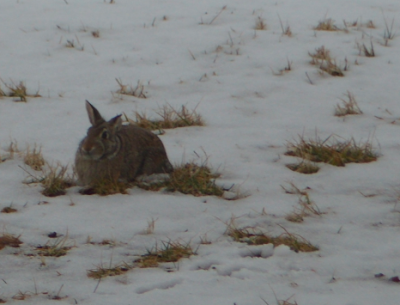 We have a rabbit trying to hunker down for one of the few grassy areas in our yard. Meanwhile, the Wichita "snow hole" is in evidence. 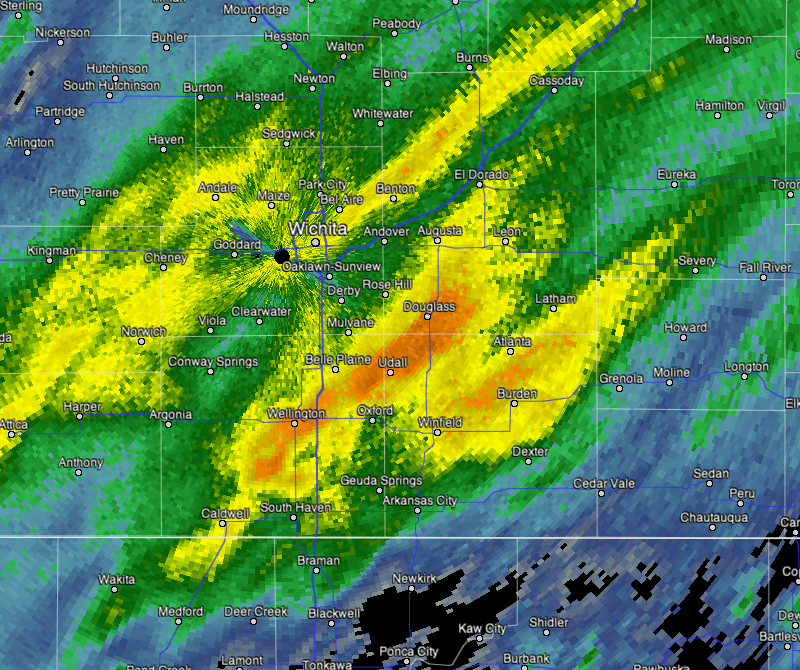 It has been snowing hard over the western and north suburbs. 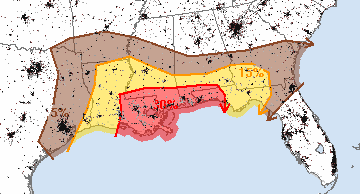 The area in 5% has a significant tornado threat. 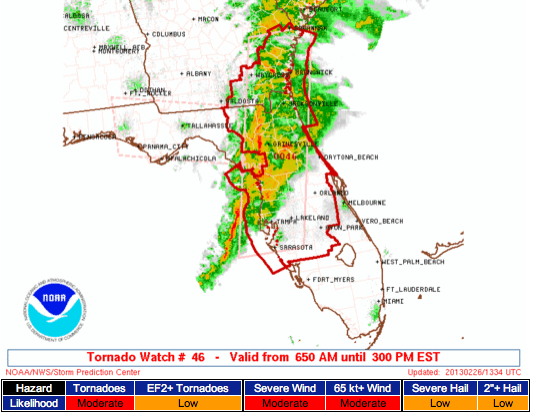 And, here is the threat of damaging thunderstorm winds (60 mph or higher). Fifteen percent is the significant threshold. 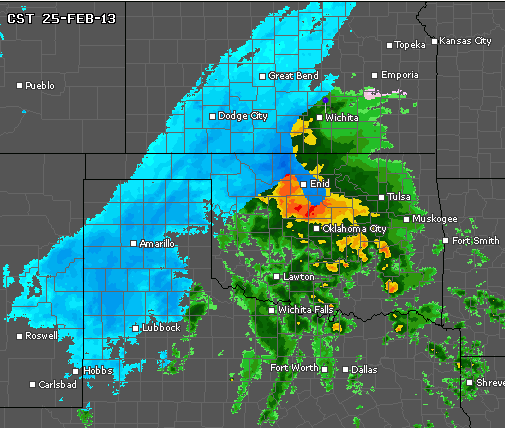 7:50am updates: 11" already at Amarillo, TX. Roads closed throughout the Texas Panhandle including I-40 east from Amarillo. 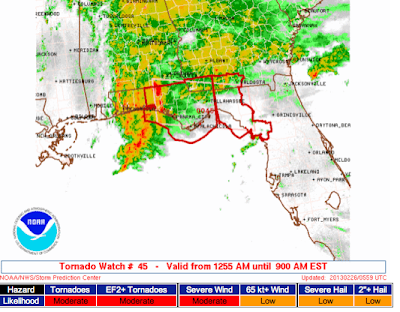 And, here are National Weather Service warnings. 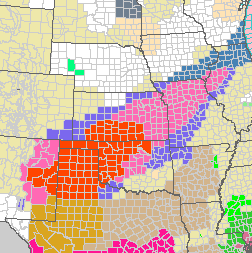 Orange are blizzard warnings and pink is winter storm warnings. Amber are high wind warnings. Rose are wildfire warnings.